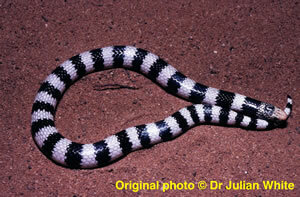 Very small in length, cylindrical, medium bodied burrowing snake with a very short tail. Can grow to a maximum of about 0.33 metres. Head is medium in size, no canthus rostralis and indistinct from neck. Snout is depressed, angular in profile ( but not tipped with cutting edge ) and rounded when viewed from above. Eyes are small in size with vertically elliptical pupils. Dorsal scales are smooth and glossy. Dorsal scale count 17 (16 ) - 15 - 13 ( 11 to 14 ). Inland sandy desert and scrub plains of red sandy loams in mallee, myall and mulga woodland and shrublands ( including coastal heaths ). 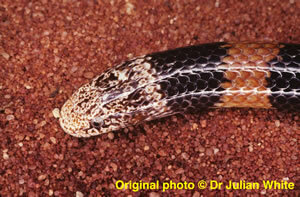 Nocturnal, secretive and fossorial, snake. Active on the surface only at night. Shelters in loose sandy humified soil under shrubs, trees and fallen timber. Head is often protruded above the surface ( snout is well camouflaged ) to ambush prey. Very shy snake which attempts to flee for cover if disturbed. 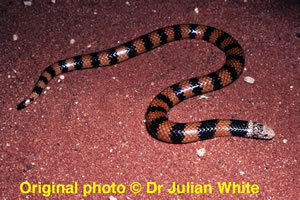 Only known to feed on small skinks ( Lerista, Ctenotus, Menetia and Morethia species ) and legless lizards ( Aprasia genus ). Bites by Simoselaps species are minor, not requiring treatment, other than ensuring tetanus immunisation. Most cases will be minor & not require admission.